I’m so excited to share this sweater with you. Why? Well, to start, I’m utterly in love with it. It’s the first time I’ve been able to take a commercial pattern and knit it on my machine. 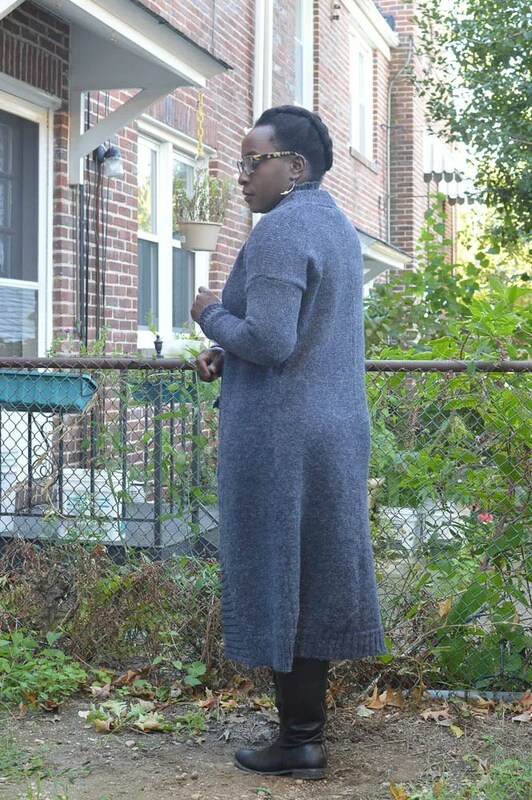 The Corvid Coat from Brooklyn Tweed conveniently has a schematic so I could use Garment Designer to draft the design and produce a machine pattern for me. Also, it appears they hired my reincarnated self to model the design…. A few changes (and flaws), well, one big one. The collar and lower front extension on the original is in cartridge rib. I think the closest approximation my ribber does to this is fisherman’s rib. But, because I hadn’t done it before and requires tucking – which I also haven’t done before- I just made a 2×2 rib. But, don’t fear. I plan to make this in a cream Corriedale yarn I bought last year and will do fisherman’s rib then. The flaw: my collar isn’t wide enough. If you look at the original design, it flips back on itself and still looks about the same width as the lower ribbing. I read the directions to be five inches in width. But, I got it wrong. When I make this again, I’ll widen the collar to 8 to 10 inches and lengthen the collar a few inches (I accidentally made mine a few inches short). The sleeves are also snug on me (although now that I’ve worn it around, they have loosened up). Which I could clearly see when I drafted it in Garment Designer. But, I decided to go with the exact provided measurements instead of, oh, you know using the software I own that allows me to customize fit. Because the Corvid is mostly straight stockinette, this knit very quickly with whole swaths of simple knitting (no increases or decreases). 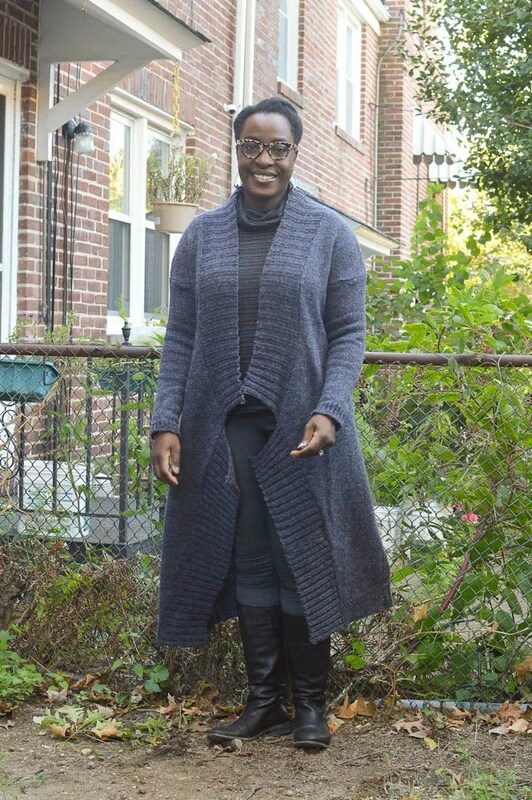 I knit this on my bulky Brother 270 (new to me this summer) in a sport weight yarn from Bartlett yarns that I picked up at Maryland Sheep and Wool this year. This weight yarn probably knits best on a mid-gauge machine. I knit this on Tension 1 (which the lower the number, the tighter the tension). I’m also so sad now I’m going to miss MDSW in 2017. We have two weddings in May. One of them in NY during MDSW. I am not 100 percent happy with the ribbing.Before blocking, it had a nice beefy hand and great definition. But, post wet block, the 2×2 rib looks a bit flat along the front hem. I’m not sure if that’s a product of the yarn or the Tension 0 I knit it on (again, the bulky machine isn’t ideal for a sport weight yarn). So, for the collar and lower front extension, I used steam to give the ribbing a final block. I know that a lot of people hand knit the ribbing and add it to the machine. But, I have really bad tendinitis in my hands that prevent me from hand knitting. Due to the width of the back and lower rib, I did have to knit them in sections and seam them together. But, I think it’s really hard to tell unless you’re looking. Any who, if you can’t tell, I AM FEELING MYSELF. I am so happy to have a REAL sweater made from REAL wool that I made. It’s EXACTLY why I wanted to try machine knitting. And, I get to wear it during the fall! What’s next… a good question. I’m kind of swamped with work the next few weeks. I quit my 9 to 5 back in July and have had a (miraculous) steady stream of consulting work since then. It’s been extremely liberating. But, not nearly the amount of time I thought I would have with my sewing and knitting. When things calm down in November, I’m thinking of either Brooklyn Tweed’s Brighton with a diamond shape tuck stitch or the lovely raglan sleeve Roslyn (both designed by my friend Veronik). But, seriously, at some point I need to start holiday gifts…. It’s gorgeous! you wear it well!! Enjoy it!!! You did an awesome job on this. If you want the “lapels” to fold back, couldn’t you simple tack them back with a few crochet stitches? Looking forward to seeing your future machine knit projects! Congratulations! There is no better feeling than putting lots of time and effort and finally succeeding in your quest. 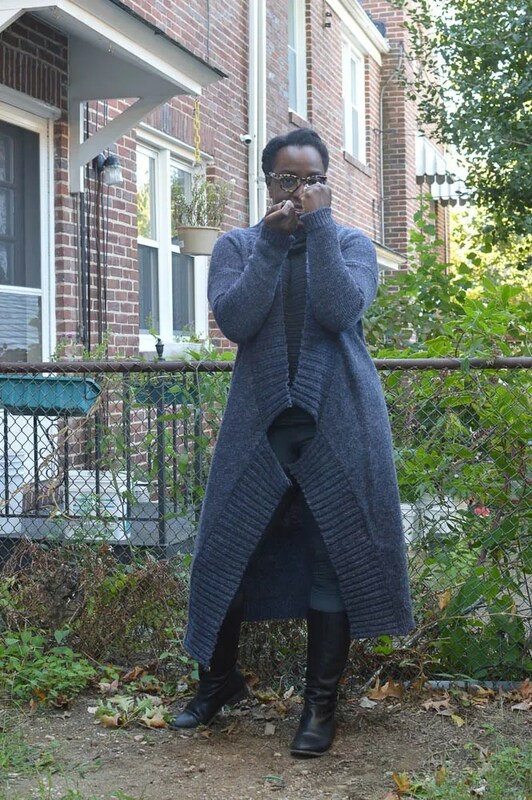 This is a great sweater coat. I have developed arthritis in my hands and can no longer hand knit like I used to, and I have thought about getting a knitting machine, but I am totally intimidated by them. I do not have an encouraging history with operating machinery. It must be very encouraging to be able to have a garment made and wearable in the same season! Just beautiful! Excellent job. I myself mk so many garments in the 1980’s. I know by experience how much is involved with charting and all. You inspire me to bring out my machines and start mk again. Thank you for sharing! I kind of like it without the folded back collar. We bustier gals need less bulk in that area. It looks more tailored that way. When I folded it back, it looked like I was framing the girls. I think if I can double the width of the band to 10 inches, so it folds back and is still five inches wide, I can make it work. But, I’m totally happy with it now too. You’re right, it has a sleek and symmetrical look to it. I much prefer your collar to the original, and I’m so impressed with how you’ve progressed with machine knitting. 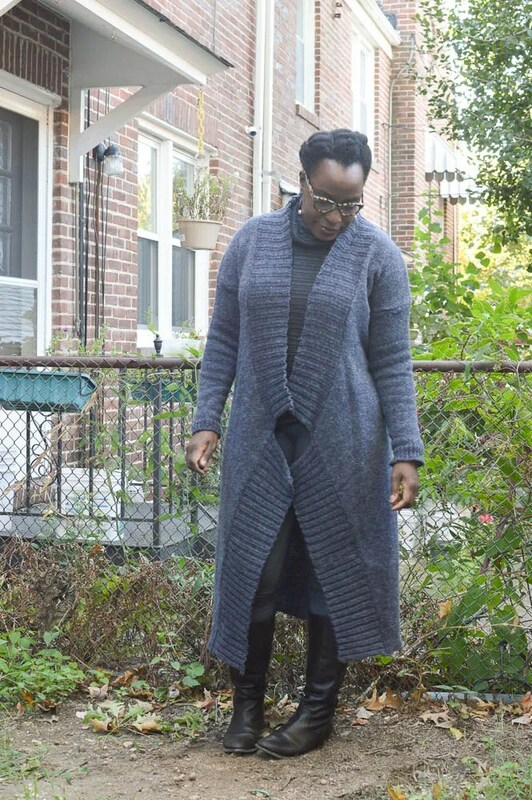 That is one very professional looking coat.I regret buying a standard gauge machine, I think I would get more use from a mid-gauge and dk weight yarn . But honestly, the real issue is that I don’t set aside time to use the machine I have! Yeah.. it really takes time to sit down and play with it. I still haven’t gotten the full hang of short rowing — which is a total basic thing. And, I need to learn to use my Knit Leader. But, again, I just haven’t sat done to play with it. When I was looking for machines, I definitely wanted a standard over the bulky. I was lucky to get both when I purchased. I now totally get why people like the bulky for making clothing like sweaters. It has that hand knit look and goes really fast. If I had to have one machine, I think I’d wanted a metal bed mid gauge with ribber myself. I’m so impressed! No one would have noticed the “flaws”. Beautiful! Love it! I was going to ask you if you thought I could get away with a seam down center back, so yours isn’t very obvious. Oh, good! And, it’s not a nice invisible stitch like a mattress stitch seam either. I ‘sewed’ it together on my linker. This is beautiful and you wear it fabulously. So cozy and absolutely gorgeous! You’ve come a long way since you got your first knitting machine. Congrats! Awww! Thank you! Now, I just have to learn a fraction of what you know about yarn. It’s a total mystery to me. Take it! And, prepare to be totally baffled. 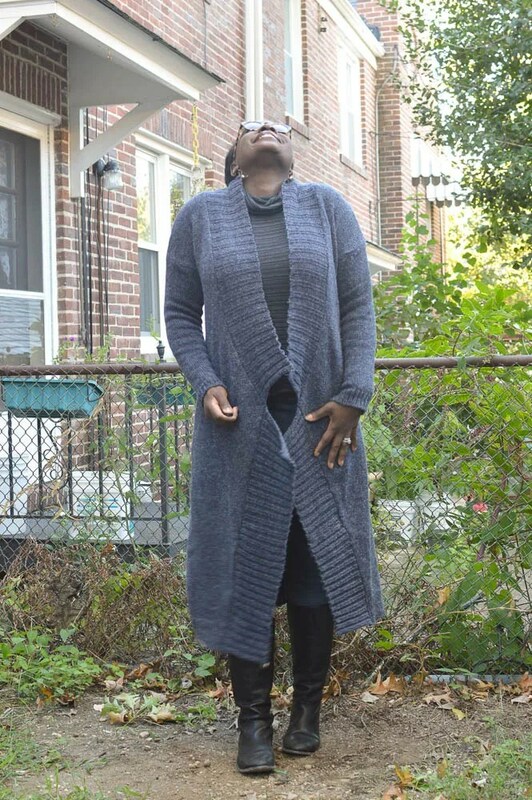 It’s so great that you’re experienced enough with your knitting machine to turn out such a wonderful sweater coat! Just remember that with sewing, it took time to make garments that you felt were 100% and you’re on the road to making 100% sweaters too. It’s going to be fun to watch this new creative journey you’re on and to see what you create. Thanks, Carolyn! You’re right. It was a while before I had true confidence in sewing. I need to be a little more patient with myself! Didn’t understand a word of what you wrote in this post but I already told you on IG this looks amazing. So many questions I could ask like: how does this compare to knitting by hand and how long did this piece take? I find it fascinating and I am envious of anyone who knits but nope, right now, I have no plans to start knitting. Omg!! You did a wonderful job. Can’t wait to see the next one. Happy you were able to quit your 9 to 5 and work for yourself. Shut up!!! You made this???? My mind is blown. Gorgeous!!! It’s CRAZY, right? I owe my husband at least one pullover, a cardigan and a knit tie. I think he’s going to enjoy my learning machine knitting more than anyone! Wow, wow, wow, and wow! Beautiful work! The seam is quite invisible, the firm drape of the fabric created by your tension choice is perfect, and even the “mistake” collar width is exactly right on you. You have every right to be feeling yourself. And how! Thank you! And, thanks for noticing the tension! I ripped it out when I started at Tension 0 and thought his had a little more flow. Yarn properties are still a total mystery to me. No MDSW next year? Me, either, at this time. Of course, plans change, engagements get called off and so on. Of course, you could go to Rhinebeck NY for New York Sheep and Wool this weekend. It is a lovely drive…..If only I were home. I once spent four years diddling around with a cable scarf that I never finished. I just couldn’t keep the counts straight and my hands just ached. This… it’s so much closer to sewing with more of the mechanics I like about stuff. You’re right. This is the project that helped me “get” machine knitting! If I tried this by hand I would just cry. And, still be crying three years later, lol! OMG. I want one too. what can i barter with you to get me one?? do i have anything or any skills you need/want??? i am serious. also, how much yarn did it take to make that? Haaaaa! I’ve spent an obscene amount of time planning my wardrobe around this coat. I want to make a cream one this year but it occurs to me it will get filthy. I barely have enough confidence in my sewing skills to barter or trade nevermind my knitting. But, if you ever want to learn how the machine works, I’d be happy to show you. In fact, if you want to even borrow my LK-150 (a mid gauge plastic knitting machine great for DK and worsted) to knit it and hand knit the ribbing, I’d loan it out. This is a 2-ply sport weight and took almost 3,000 yards. Or do knitters do this by weight? I had two pounds of wool from Barltett and have a little over 4 ounces left. I think this yarn was a little less expensive than general at $43 a pound. I like the ‘wooliness’ of it. It even smells like wool! It honestly reminds me of the clothes we would buy when we were kids or lived in Germany. I just can’t believe I knit this. And, it came out. Like, I am MARVELING. P.S. – i’m on my way to Rhinebeck this weekend. This is gorgeous and epic and makes me want to learn to machine knit!!!!! that is fabulous! and you look stunning in it. Fantastic make!!! You should be the poster child for kniting machines. 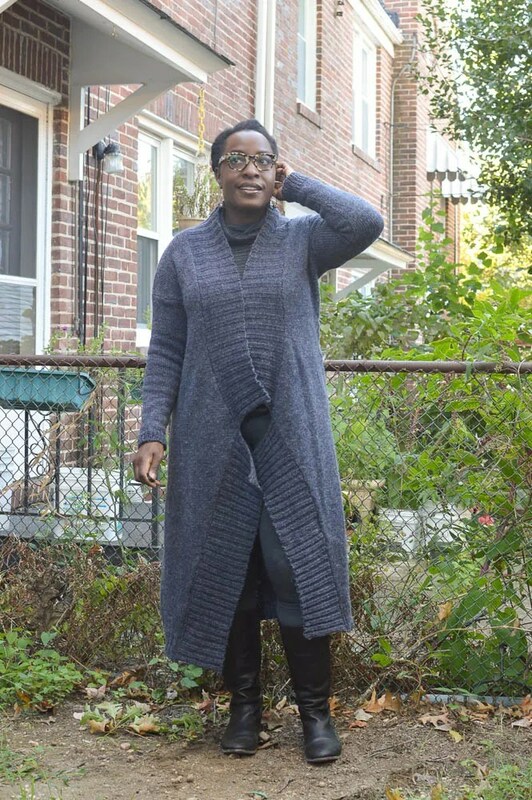 I remember you posting several years ago about the challenge of finding RTW wool sweaters and now that doesn’t have to be a problem….you can just knit your own! Fabulous! I’m concentrating on sewing for now but do have machine knitting plans maybe for next year. I have a standard gauge machine. I never really mastered getting the size just right. Your software sounds great. I think software is the trick! I haven’t really done something super fitted yet. I still get nervous every time I enter in my gauge. I’m back on my standard bed this week attempting socks. I have this idea about giving them out to my family for gifts. Wet blocking a swatch can be a good way to determine how the finished fabric will look and feel. Especially ribbing, which can be tricksy. Thanks! I’m on a total knitting streak right now. Mostly to reduce the stash I’ve somehow accumulated in a year! I am SO impressed with your sweater and your progress in machine knitting. I am still scared of my KM, but am getting there – you are inspiring me!